Supercritical fluids behave either like a gas or a liquid, depending on the values of thermodynamic properties. This tuning of properties, and other advantageous properties of supercritical fluids led to innovative technologies. More than 100 plants of production size are now in operation worldwide in the areas of process and production technology, environmental applications, and particle engineering. New processes are under research and development in various fields. 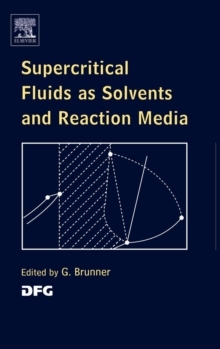 This book provides an overview of the research activities in the field of Supercritical Fluids in Germany. It is based on the research program "Supercritical fluids as solvents and reaction media" on the initiative of the "GVC-Fachausschuss Hochdruckverfahrenstechnik" (i.e. the German working party on High Pressure Chemical Engineering of the Society of Chemical Engineers). This research program provided an immensely valuable platform for exchange of knowledge and experience. More than 50 young researchers were involved contributing with their expertise, their new ideas, and the motivation of youth. The results of this innovative research are described in this book.